For related races, see 1840 United States elections. Presidential election results map. Buff denotes states won by Harrison/Tyler, blue denotes those won by Van Buren & one of his three running mates. Numbers indicate the number of electoral votes allotted to each state. The Whigs did not get to enjoy the benefits of their electoral victory. The 87-year-old Harrison was the oldest U.S. president elected until Ronald Reagan won the 1980 presidential election, and Harrison died a little more than a month after his inauguration. Harrison was succeeded by John Tyler, who proved to be disastrous for the Whigs. While Tyler had been a staunch supporter of Clay at the convention, he was a former Democrat and a passionate supporter of states' rights. As President, Tyler blocked the Whigs' domestic legislative agenda and was expelled from the party. Van Buren, the incumbent president, was re-nominated in Baltimore in May 1840. The party refused to re-nominate his sitting vice president, Richard M. Johnson, but could not agree on an alternative, and so nominated no one. This remains the only time since the passage of the 12th Amendment, that a major party failed to do so. In the electoral college, the Democratic vice presidential votes were divided among Johnson, Littleton W. Tazewell, and James K. Polk. Three years after Democrat Martin Van Buren was elected President in the election of 1836 over three Whig candidates, the Whigs met in national convention determined to unite behind a single candidate. The convention was chaired by Isaac C. Bates of Massachusetts and James Barbour of Virginia presided over the convention. The party nominated the popular retired general William Henry Harrison of Ohio for President, the most successful of the three Whig presidential candidates from the previous election. Harrison won a close victory on the convention's fifth ballot against party founder Henry Clay and General Winfield Scott. Harrison, though a slave-owner and aristocrat, was perceived as being simple and a commoner. The convention nominated former Senator John Tyler from Virginia for Vice President. The two would go on to win the 1840 presidential election by defeating Van Buren. Because Harrison (born in Virginia) was considered a Northerner (as a resident of Ohio), the Whigs needed to balance the ticket with a Southerner. They also sought a Clay supporter to help unite the party after Clay's loss on the balloting. Tyler was finally chosen by the convention after several Southern Clay supporters had been approached but refused. Tyler had previously been the running-mate of Hugh Lawson White and Willie Person Mangum during the four-way Whig campaign at the previous election. After the negative views of Freemasonry among a large segment of the public began to wane in the mid 1830s, the Anti-Masonic Party had begun to disintegrate. Its leaders began to move one by one to the Whig party. Party leaders met in September 1837 in Washington, D.C., and agreed to maintain the party. The third Anti-Masonic Party National Convention was held in Philadelphia on November 13-14, 1838. By this time, the party had been almost entirely supplanted by the Whigs. The delegates unanimously voted to nominate William Henry Harrison for president (who the party had supported for president the previous election along with Francis Granger for Vice President) and Daniel Webster for Vice President. However, when the Whig National Convention nominated Harrison with John Tyler as his running mate, the Anti-Masonic Party did not make an alternate nomination and ceased to function and was fully absorbed into the Whigs by 1840. The Liberty Party was announced in November 1839, and first gathered in Warsaw, New York. Its first national convention took place in Arcade on April 1, 1840. The Liberty Party nominated James G. Birney, a Kentuckian, former slaveholder, and prominent abolitionist, for President while Thomas Earle of Pennsylvania was selected as his running mate. In the wake of the Panic of 1837, Van Buren was widely unpopular, and Harrison, following Andrew Jackson's strategy, ran as a war hero and man of the people while presenting Van Buren as a wealthy snob living in luxury at the public expense. Although Harrison was comfortably wealthy and well educated, his "log cabin" image caught fire, sweeping all sections of the country. Harrison avoided campaigning on the issues, with his Whig Party attracting a broad coalition with few common ideals. The Whig strategy overall was to win the election by avoiding discussion of difficult national issues such as slavery or the national bank and concentrate instead on exploiting dissatisfaction over the failed policies of the Van Buren administration with colorful campaigning techniques. Harrison was the first president to campaign actively for office. He did so with the slogan "Tippecanoe and Tyler too". Tippecanoe referred to Harrison's military victory over a group of Shawnee Indians at a river in Indiana called Tippecanoe in 1811. For their part, Democrats laughed at Harrison for being too old for the presidency, and referred to him as "Granny", hinting that he was senile. Said one Democratic newspaper: "Give him a barrel of hard cider, and ... a pension of two thousand [dollars] a year ... and ... he will sit the remainder of his days in his log cabin." Results by county explicitly indicating the percentage of the winning candidate in each county. Shades of yellow are for Harrison (Whig) and shades of blue are for Van Buren (Democrat). Whigs took advantage of this quip and declared that Harrison was "the log cabin and hard cider candidate", a man of the common people from the rough-and-tumble West. They depicted Harrison's opponent, President Martin Van Buren, as a wealthy snob who was out of touch with the people. In fact, it was Harrison who came from a family of wealthy planters, while Van Buren's father was a tavernkeeper. Harrison however moved to the frontier and for years lived in a log cabin, while Van Buren had been a well-paid government official. Nonetheless, the election was held during the worst economic depression in the nation's history, and voters blamed Van Buren, seeing him as unsympathetic to struggling citizens. Harrison campaigned vigorously and won. Harrison won the support of western settlers and eastern bankers alike. The extent of Van Buren's unpopularity was evident in Harrison's victories in New York (the president's home state) and in Tennessee, where Andrew Jackson himself came out of retirement to stump for his former vice-president. Few Americans were surprised when Van Buren lost by an electoral vote of 234 to 60. But many were amazed by the close popular vote. Of 2,400,000 votes cast, Van Buren lost by only 146,000. Given the circumstances, it is surprising that the Democrats did as well as they did. Of the 1,179 counties/independent cities making returns, Harrison won in 699 (59.29%) while Van Buren carried 477 (40.46%). Three counties (0.25%) in the South split evenly between Harrison and Van Buren. Harrison's victory won him precious little time as chief executive of the United States. After giving the longest inauguration speech in U.S. history (about 1 hour, 45 minutes, in cool weather), Harrison served only one month as president before dying of pneumonia on April 4, 1841. This was the first election in US history in which a candidate won more than a million popular votes. This was the last election where Indiana voted for the Whigs. It is also the only election where the Whigs won Maine, Michigan, and Mississippi. The election was also the last time that Mississippi voted against the Democrats until 1872, the last in which Indiana did so until 1860 and the last in which Maine and Michigan did so until 1856. Source (Popular Vote): Leip, David. "1840 Presidential Election Results". Dave Leip's Atlas of U.S. Presidential Elections. Retrieved July 27, 2005. Source (Electoral Vote): "Electoral College Box Scores 1789–1996". National Archives and Records Administration. Retrieved July 31, 2005. (a) The popular vote figures exclude South Carolina where the Electors were chosen by the state legislature rather than by popular vote. Source: Data from Walter Dean Burnham, Presidential ballots, 1836–1892 (Johns Hopkins University Press, 1955) pp 247–257. And down will come Tyler and Tippecanoe. You will discover Tip is a fake. He sits in his cabin a'drinking bad rum. You need not fear of Tip and his Ty. What they would ruin, Van Buren will fix. Van's a magician, they are but tricks. In the film Amistad, Van Buren (played by Nigel Hawthorne) is seen campaigning for re-election. These scenes have been criticized for their historical inaccuracy. ^ a b Between 1828–1928: "Voter Turnout in Presidential Elections: 1828–2008". The American Presidency Project. UC Santa Barbara. Retrieved November 9, 2012. ^ "About US President William Henry Harrison". What is USA News. September 17, 2013. Retrieved September 16, 2012. ^ Watson, Harry L. (2006). Liberty and Power: The Politics of Jacksonian America. New York: Farrar, Straus and Giroux. p. 226. ISBN 0-8090-6547-9. ^ Foner, Eric (March 1998). "The Amistad Case in Fact and Film". Gunderson, Robert Gray (1957). The Log-Cabin Campaign. Lexington: University of Kentucky Press. Greeley, Horace (1868). Recollections of a Busy Life. 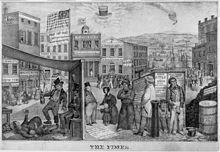 Greeley's description of the 1840 election is posted on Wikisource. Holt, Michael F. (1999). The Rise and Fall of the American Whig Party: Jacksonian Politics and the Onset of the Civil War. Oxford University Press. ISBN 0-19-505544-6. "Overview of Whig National Convention of 1839". Our Campaigns.com. Retrieved February 12, 2018. This page is based on the Wikipedia article 1840 United States presidential election; it is used under the Creative Commons Attribution-ShareAlike 3.0 Unported License (CC-BY-SA). You may redistribute it, verbatim or modified, providing that you comply with the terms of the CC-BY-SA.